Thank you soooooo much Ann for this generous and awesome tutorial!! !I can not wait to get started!I have been a fan of your work so long and this is so exciting,to be able to make something myself with your patterns!thank you again! OHH I’m in love of your work. 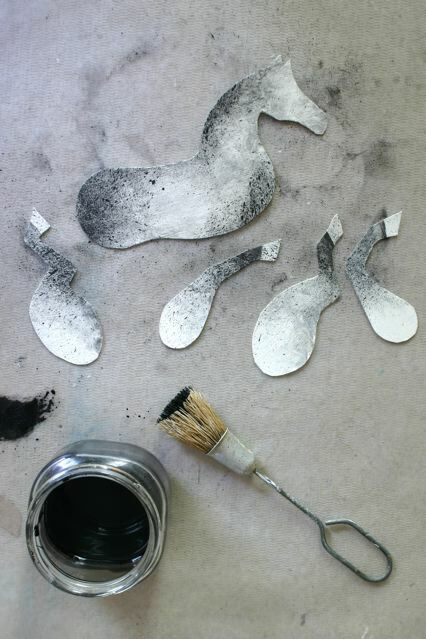 This idea of a daily horse as a kind of creative routine is brilliant and the result looks so great ! Did it actually work to prevent “creative paralysis” ? Thank you so much dear Ann! you and your art are marvelous!!!!!! Thank you soooo much for the pattern and tutorial! I have admired your work and cannot wait to try to make a couple of them!! Wondering if you have seen an old art film, Dream of Wild Horses. Thanks Ann for sharing this! I’m going to make some and use them in my scrapbooking and cards – how gorgeous are they? 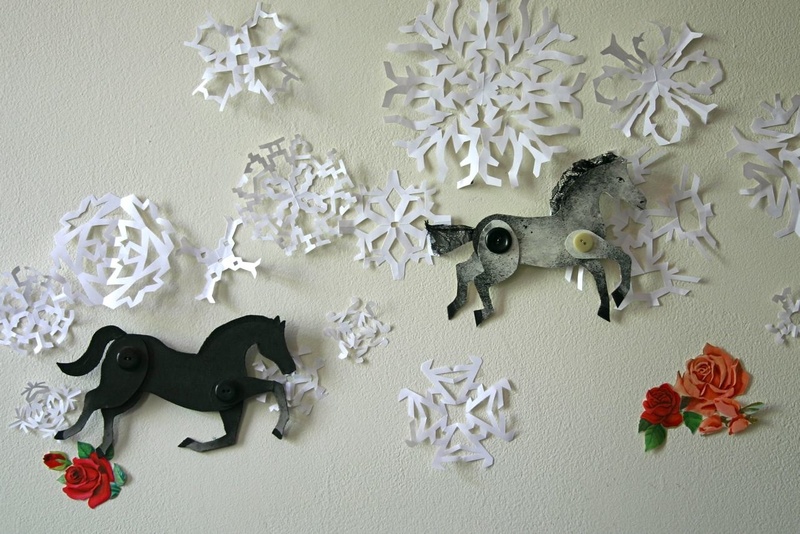 I happened to stumble on to your blog and I was so excited to see your hundred horse project! I grew up with horses as my first love and I now have a granddaughter who loves horses as well. 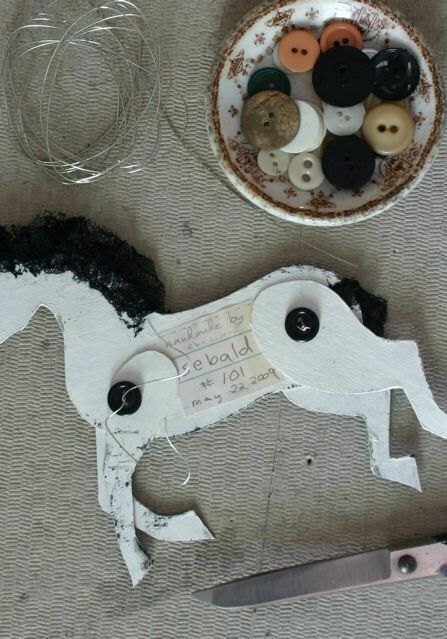 I am going to make her some horses for her room. Thank you for being so generous. Just wanted to say thanks so much for the inspiration, and patterns. Your art is so lovely. Check out our blog to see our herd started across my daughter’s wall. I AM GRINNING right now. Ever since your hundred horses piece I have had a desire to make these. I never did quite get around to making my own pattern. I was even thinking of this project as recent as yesterday, and here I find it as a GIFT from you today! THANK YOU so very, very much. I am really looking forward to making some! Thank you for posting your pattern. 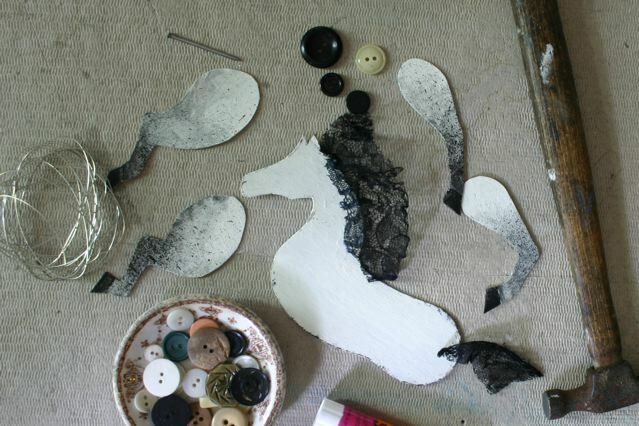 I’m making felt horses with it. I Used brads on the blue one, out of buttons! This is such a fun Idea! The kids and I are going to start a Summer Stampede. I thought was truely wonderful idea and wanted to try it myself as a gift for my niece who loves horses. After 15 peices completed, I had to stop. They are absolutely wonderful, but now I can really appreciate all the work you put into 100. They are so whimsical and delightful and I appreciate you sharing them. thanks so much for posting your templates. i finally got around to making a few horses out of some paint chips i had lying around. turns out repetative cardstock cutting is like stress therapy for people without health insurance. 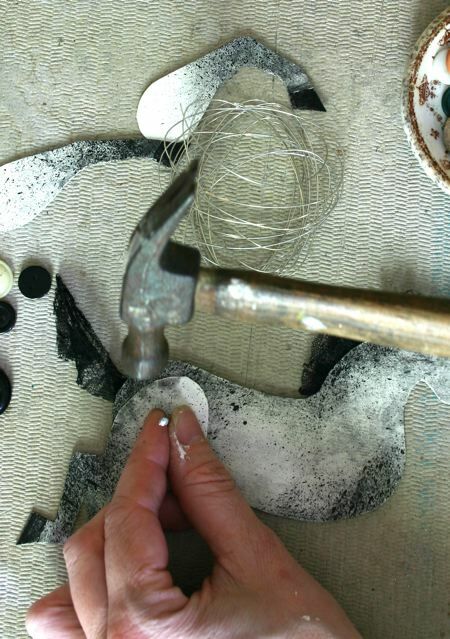 You’re extraordinarily talented, I could browse through your shop and blog for ages… so inspirational! Thank you! This is exactly what I’m going to do with my nieces next weekend. You have the best ideas. love this project and had to post. Your work is stunning Ann. I happen to stumble onto your site!! I want to do a horse a day too!! Thank-you for being so very generous with you tute!! These are so great! My mom actually owns the little green one at the bottom with newspaper/ print mane and we love him, we just had no idea who made him. I was so excited to stumble upon your blog – great work! Just finished cutting out three pink floral (all different florals) horses. Am going to mount them on black glossy c/s. Thank you so much…love having a bit of whimsy to start my day! What an incredible work – This is awesome !!! 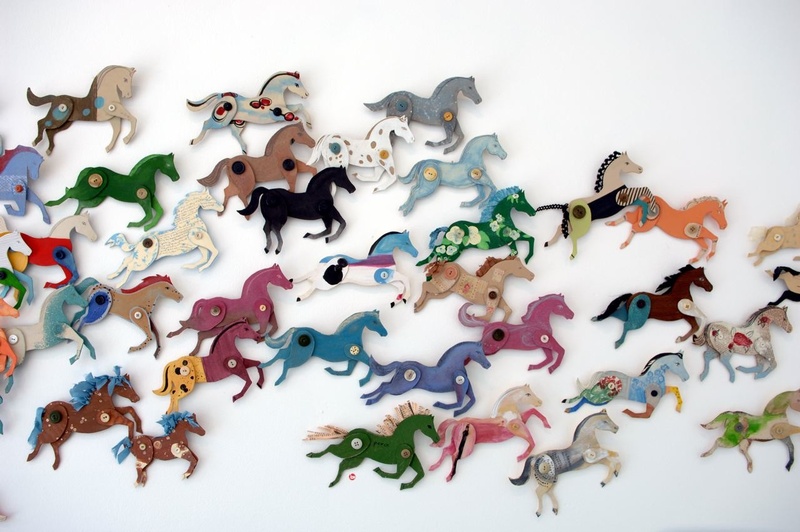 Loooove your horses…..it just shows how a bit of creativity each day can turn into this beautiful stampede of horses. What a delight! formidable !!! j’admire votre talent, merci pour le partage de vos chevaux merveilleux. I found this tutorial from a link on a blog – and waow ! My daughters love horses, and the February holidays have just begun here. We are going to have cold weather that will prevent them from playing outside – this will just be perfect to spend a creative afternoon that they WILL enjoy, I know it ! Thank you very much ! thanks so much for sharing!! i love these, and finally made them! This is fabulous! I’m going to do some with my son this week! These are fantastic! 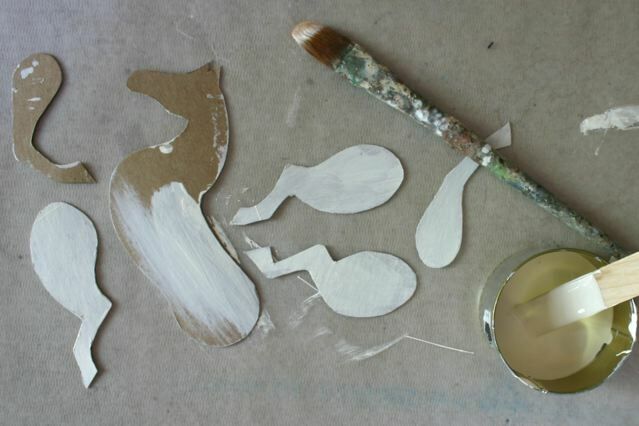 I often work with children and use brass rivets to make movable limbs on characters – dolls, animals, monsters. 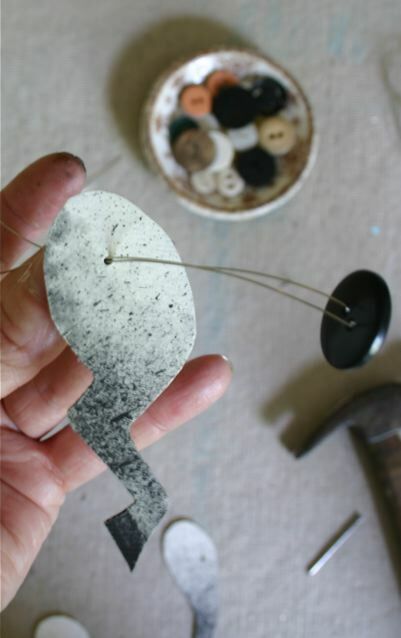 Using the buttons and wires is a wonderful alternative, and so much more creative. Thanks for the idea! beautiful horses. They would make lovely garlands for a party banner or even mobiles! these are simply lovely. Thank you for the inspiration. I have your beautiful horses as my front page on my computer (whatever you call it.. desk page?) I have started painting it.. red and white stripes for my sister who I remember loved her ‘horkie’ a red and white stuffed animal. I am finding the cardboard curls a little. 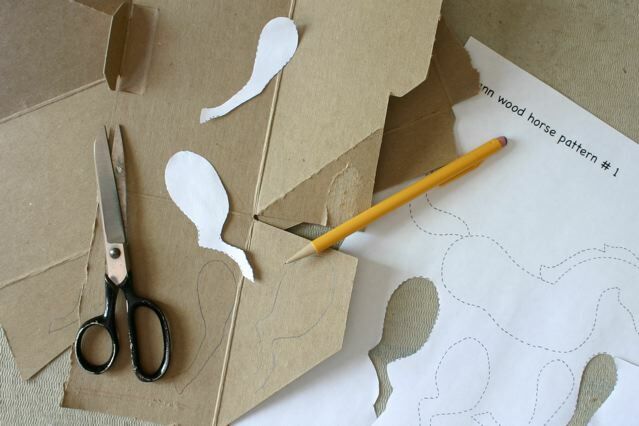 Should I use thicker cardboard? (but then it will be difficult to cut.. ) please advise. Your website is WONderful! What a fun idea! And when you make 100 of them is really a powerful statement. Thanks for sharing this! I started making some in October, and just got around to posting pictures to my blog. 🙂 I was really excited to try it today. I tried it with acrylic craft paint on the cereal box. For some reason, multi coat is still unable to cover the cereal graphic. 🙁 I wonder what type of paint I should use? I stumbled upon this site completely by accident and now I am completely enthralled and can’t wait to make my own. Beautiful project, thanks for sharing. This is the best pattern I’ve found for a poseable horse. It’s going to make the best craft for my horse-loving 4-year old. Thank you! Ann, Thank you so much for sharing your horse pattern. I and several of my daughters are horse-lovers. I have ideas of what to do with your horse pattern swimming around in my head. Hopefully I can hang onto them long enough to implement them – Christmas Day is almost here! I have made two red and white striped horses with red hair for their tails. I hope I can somehow post my two horses on your website so you can see what I have done. Thank you for your wonderful tutorial on this! I am very impressed with this project. You did a lovely job of it. I love it! Thanks for your inspiration and sharing this with us!!! I have to try these out with tin! I have a stash of scrap ceiling tin… now, what to do about the sharp edges? Excellent Post, but this has nothing to do with dog fencing. Your cardboard horses are very nice! I suggest you turn it into a paper mache 3D horse so you can preserve it for long time. 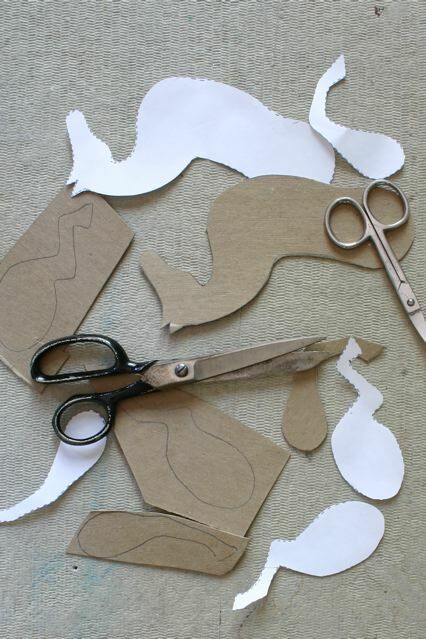 I find that your paper horses templates are no longer available on your site. Is it possible to get the patterns somehow? My great niece wants to do a stampede on her wall and will be heartbroken if I have to tell her it won’t be possible. The horse templates are indeed still available. In the list of supplies, the link that says pattern worked for me on June 29, 2016 with no trouble at all. do you also have donkey ones? Thank you very much for this wonderful and generous tutorial. 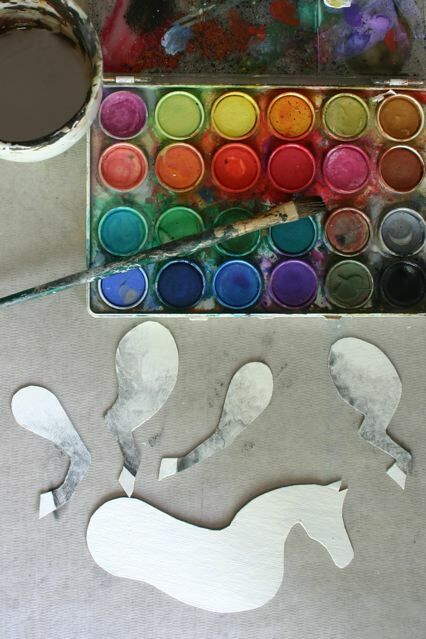 i am keen to do this with my after school art club. How did you hang all those horses on in the wall. I have a great place in my room for all these i am working on. How did you hang all those horses on your wall. Just starting mine this week. Thank you Ann for such a fun project! I used little picture nails – they are hung from the wire in the back. Good luck with your stampede! Looking forward to getting some of those Other patterns soon. Going to be a great 2018! Thank you Ann! For several years my grandchildren and I have created your horse stampedes and we always have so much fun! I love how different each one is… just like the grands themselves. We just use brass brads instead of buttons to simplify that process. And we all enjoy the naming process too and then admiring them mounted on the wall. Visitors always enjoy the frisky stampede on my wall as well. One of these days I’ll try your one-a-day project. Love everything about this! Great Big Thank YOU!